This necklace is made using two colors of leather cord on top of waxed cording. The length can vary from about 18 to 21 inches with a center jeweled piece that adds 3.5 inches. 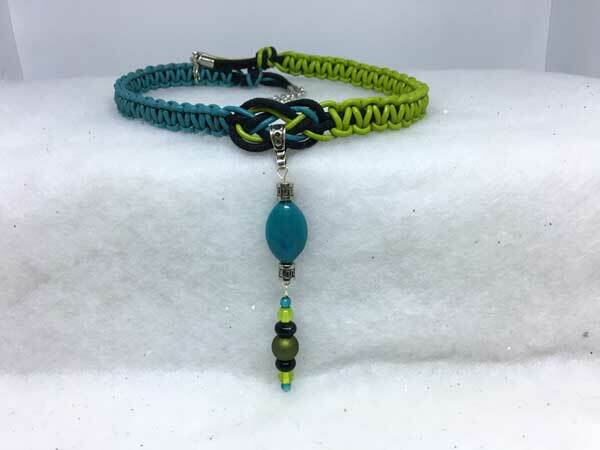 It is done in teal, chartreuse and black. The jeweled piece starts with a teal acrylic bead between silver spacers. Hanging separately is an olive round, surrounded by black rondelles, chartreuse rounds and teal rounds.